You took something that didn’t belong to you. 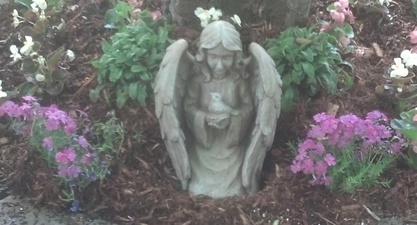 Two years ago I “planted” that angel in front of two forget-me-nots in honor of people I love. On either side of her stood two solar lights that meant she’d never be in the dark. When I’d come home late, I’d glance at her as I waited for the garage door to open and see the soft glow that surrounded her. I sprayed her off most days when I watered the flowers over which she stood vigil. She became a trigger for prayers I silently offered for the sweet souls she came to represent. She cost all of $12 and I’m sure there are duplicates of her that number in the thousands. But she was mine. And in some small way, I felt like I was hers. Did I think she had special powers or that she was more than a handful of plaster sitting among flowers? No, of course not. But she was a guardian angel, for crying out loud. The epitome of that which watches over us from afar. Comforts us, protects us, guides us. And yes, she also just sat there and looked pretty. So my question is, Where is she now? Is it possible that you could just pluck her out of my yard and put her in your own yard and still somehow enjoy her? When you took her, was it the first time you’d walked past my house or the hundredth? I actually hate how much that question bothers me. Maybe you dumped her in the trash after the “fun” you had stealing her, the entertainment as disposable as you allowed her to be. I’m oddly more upset than I probably ought to be. I’m mad, shocked and dismayed that you took her, but ultimately the peace I found in that angel remains with me. She no longer sits outside under my tree. Yet I know that those I love and thought of each time I saw her are still loved just as fiercely as ever before. I have the memory of them, the dreams for them, and the absolute belief that I will see them one day. Greeted by angels and a loving God who even now while I feel like an idiot for crying about this small token, loves me, protects me, and watches over me.